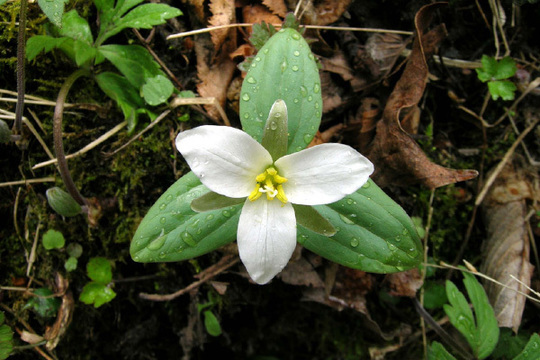 Snow trillium (Trillium nivale), a threatened species in Wisconsin, is often one of the first plants to bloom each year. Photo by Armund Bartz. Explore the beautiful natural areas of Wisconsin this spring and summer while helping us conduct surveys for rare plants. New this year we are expanding surveys to the entire state, so we need volunteers willing to search the bogs of the north, the barrens of the west, the prairies of the south and the beaches of the east for our rarest native flora. Volunteers are trained in surveying techniques and will be shown how to accurately estimate large plant populations, use a GPS unit and assess habitat condition. Data collected by volunteers are entered into the Wisconsin DNR's Natural Heritage Inventory database where they are used by staff in various state and national conservation efforts. Mandatory training sessions will be held for all new volunteers. Anyone who has not taken the training must attend one session. See details on dates and locations below. To sign up for a training session please contact program coordinator, Kevin Doyle, by phone (608-267-9788) or email (kevinf.doyle@wisconsin.gov).